With Apple’s lagging iPhone sales, it was no secret that today’s announcement was expected to be full of pivots into services that will embed users even deeper into the Apple ecosystem. And in a nod to online privacy concerns, with each new service Apple unveiled, its speakers emphasized the privacy of user data in every respect, a not-so-subtle nod to some of its Silicon Valley neighbors. Tim Apple, er Cook, saved the biggest news of the day for last. Apple TV+ is the company’s long-anticipated foray into streaming, where it will focus entirely on original content, competing with giants like Netflix and Amazon. So how will Apple get us to pay for yet another monthly TV streaming subscription? All of the stars, apparently. 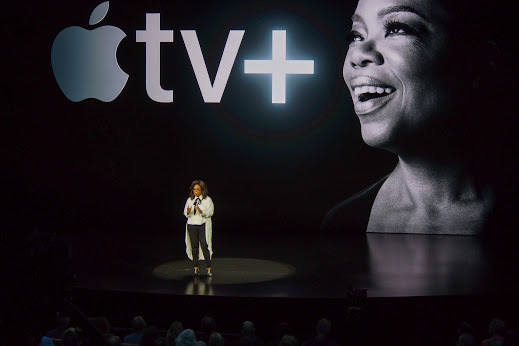 Apple highlighted five new shows that will debut with the service in the fall, all of which are helmed by some of the biggest names in entertainment, like Steven Spielberg, Jennifer Aniston, Reese Witherspoon, Steve Carell, Jason Momoa, Kumail Nanjiani, J.J. Abrams, and Oprah Winfrey. Apple didn’t unveil how much this service will cost, but it certainly has the star power to grab plenty of free trials in the fall. Apple opened its Channels segment with a promise to “only pay for the channels you want,” something that quickly revealed itself to be hollow. Yes, you can pay for the channels you want, but only in the sense that you can already subscribe to standalone services like HBO and CBS without a cable package. Channels isn’t quite a live streaming service, either, as all of its content will be on-demand. So what is it? One place for all of your various streaming subscriptions — except Netflix, which pokes a serious hole in Channels’ appeal. The good news is you won’t need an Apple TV to use it — it will also be available on Roku and Amazon Fire TV (and notably, not Google’s Chromecast). Like with News+, Apple emphasized that its curatorial expertise will make the process of finding stuff to watch much easier. It is notable that Channels will integrate with cable and satellite companies like Spectrum, DIRECTV, and Optimum to put all of their on-demand content next to your other streaming services. That said, that’s a pretty small list so far, and it remains to be seen how smooth the experience will actually be. The mission? 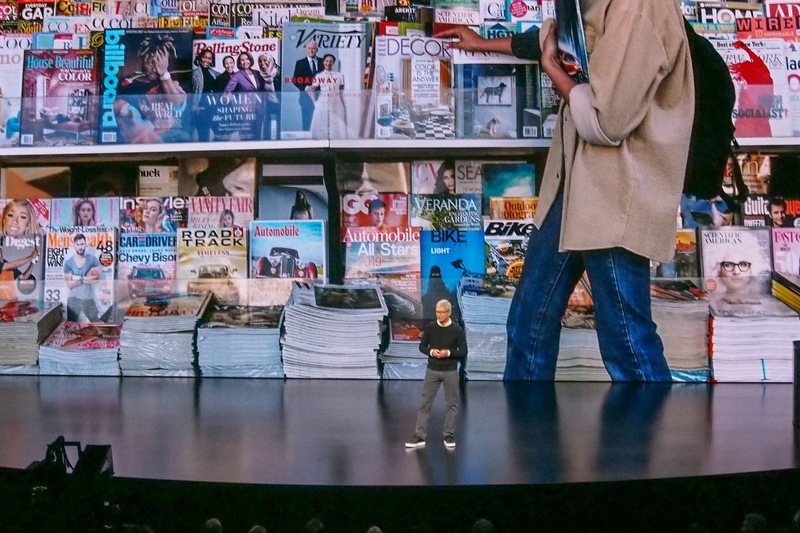 “Create the best magazine reading experience ever for mobile devices.” For $9.99 a month, Apple will give you access to over 300 magazines and newspapers, with interfaces designed specifically to look beautiful on Apple products. Some of the biggest names included are Vogue, National Geographic Magazine, People, ELLE, The Wall Street Journal and Los Angeles Times. Like with TV+, Apple promised to use its expert curation to recommend the best articles for you, while keeping your data on your device, and not sold to the highest bidder. Partnering with Goldman Sachs and Mastercard, Card is the next step in Apple Pay, which is already accepted by 70% of merchants in the U.S., according to Apple. Now you’ll get an actual titanium credit card with your name engraved, plus a rewards program: 3% cash back on purchases made directly with Apple, 2% made using Apple Pay, and 1% when using the card everywhere else. Again, security and privacy were a big emphasis, as the Card creates a unique key every time you use it, and every purchase is authenticated by face or touch ID. There are also a number of native budgeting and finance tools that come with it. 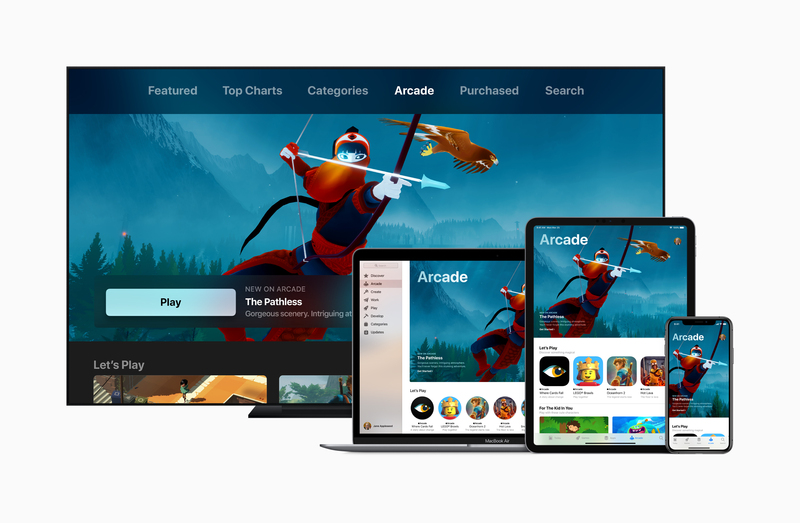 The latest extension to the App Store, Apple Arcade is the “world’s first subscription game service for mobile, desktop and the living room.” For $9.99 a month, you’ll get access to 100+ games built specifically for Apple’s ecosystem instead of paying for each individual game upfront in the App Store. Most appealingly, it’s not reliant on a solid internet connection, as all of the games are downloadable for offline gaming.